Alexander Browne (active 1659-died 1706), Artist, publisher, printseller, auctioneer and dealer. Sitter in 4 portraits, Artist associated with 149 portraits. 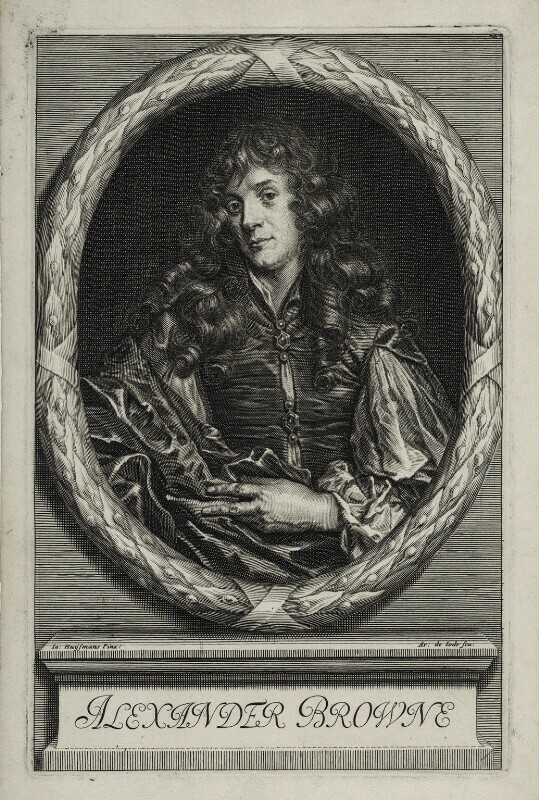 Arnold de Jode (circa 1638-1667), Engraver. Artist associated with 8 portraits. Jacob Huysmans (1633?-1696). Artist associated with 32 portraits. An indulgence is issued in Scotland, the result of Secretary of State for Scotland, John Maitland's negotiations with Presbyterians, allowing some formerly ejected clergymen to return to their ministries. Henrietta Maria, queen of Charles I, dies at the château de Colombes and is buried in the Cathedral of St Denis. Architect, Christopher Wren is appointed surveyor of the king's works. Mathematician, Isaac Newton, is made Lucasian Professor of Mathematics at Cambridge. Earlier in the year, he builds the first known reflecting telescope. Diarist Samuel Pepys, with failing eyesight, stops writing his diary never to resume. Charles II begins secret diplomatic negotiations with Louis XIV of France in April, with a view to securing an alliance against the Dutch, and financial support. Communications between the two monarchs flowed through Charles's sister, Henrietta Anne, Duchess of Orleans, sister-in-law of Louis.